Realtors, Gary and Peg Hopp, have helped many individuals and families find just the right home and we want to do the same for you also. The real estate industry is becoming more sophisticated and challenging and you need professionals that understand the business. We go the extra mile to help you achieve your goals. We continually research the market and property values so your home is priced effectively from day one. Or if you are in the market to purchase a property, we keep you informed and aware of the inventory in a timely manner. You can count on our commitment, enthusiasm, hard work, and integrity to obtain the results you want! Welcome to vacationland! 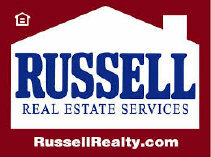 Check out our real estate listings at Russell Real Estate Services by clicking on the Russell Real Estate Services LINK ABOVE!